Located in the heart of Germany, LutherCountry captivates visitors of all ages with its cozy towns, half-timbered houses, magnificent historical buildings, and romantic countryside. Guests to LutherCountry are surprised by the countless ways this beautiful region invites them to relive and honor the life of Martin Luther. Various museums, exhibitions, and authentic sites where the Great Reformer once lived, preached, and studied open the door to the past and promise a Reformation experience unlike any other. Start your journey in Eisleben, the quaint town where Martin Luther’s life both began and ended. Find out intimate details about his life by visiting the museum inside Luther’s original Birth House. City Church of St. Peter & St. Paul: Stand inside the same grand hall where Luther was baptized on November 11, 1483. Church of St. Anne: Consecrated by Luther in 1516, this was the region’s very first Protestant church. The same pulpit from which Luther once preached is still used today, particularly for important religious holidays. Luther’s Death House: A skillful, late-Gothic reconstruction of the original Death House can still be visited today, which is now home to the exhibition Luther’s Last Path. It recounts his passing and reveals Luther’s attitude to Death. Since 1996 the building has been one of LutherCountry’s most important UNESCO World Heritage sites. Wittenberg served not only as the main stage of Martin Luther’s adult life, but also as the fountain from which the Reformation sprang. It was here in this beautiful city that Luther took on the most significant roles of his life, from student, monk, professor, and priest to husband, father, and friend. Castle Church: This church boasts what could be considered the most famous door in history; almost 500 years ago on October 31, 1517, Martin Luther nailed his famous 95 Theses to the church door for everyone to see. Although the original wooden door was eventually replaced by a large memorial door of bronze, it still marks the spot where Luther changed the course of history. To top it all off, you can also visit Luther’s final resting place inside the church and pay your respects to the Great Reformer in person. City Church: Otherwise known as the “Mother Church of the Reformation”, the City Church is also Wittenberg’s oldest building. It was an important building in the life of the Luther family, its walls having borne witness to Luther and Katharina’s wedding in 1525, the baptism of all six Luther children, and a countless number of Luther’s sermons. When planning a visit to this historical place, you should make time for one of the worship services that are held in English between May and October by pastors from around the world. Luther House: Today, it’s the world’s largest Reformation Museum, but back then, this former Augustinian monastery was Martin Luther’s home for more than 35 years. 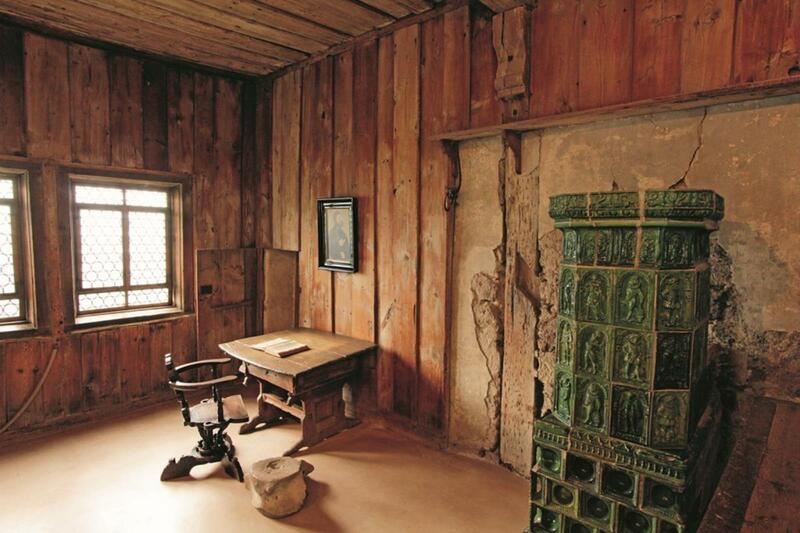 History echoes from the walls of his former living quarters, where Luther’s original desk and 500-years-old period furnishings create an indescribable atmosphere. Other must-see highlights include the Ten Commandments painting by Lucas Cranach the Elder, a Lutheran Bible from 1534, and a letter of indulgence. The Cranach Courtyards: This historical place commemorates the famous painter and fellow “Reformation Hero”, Lucas Cranach the Elder, a friend to Luther who also lived in Wittenberg for almost 45 years. The Melanchthon House: This Renaissance style house was once the home and workplace of fellow Reformation champion and humanist, Phillip Melanchthon. Today, this UNESCO World Heritage site contains a museum with a spectacular permanent exhibition entitled “Philipp Melanchthon: Life – Work – Impact” – a definite must-see! 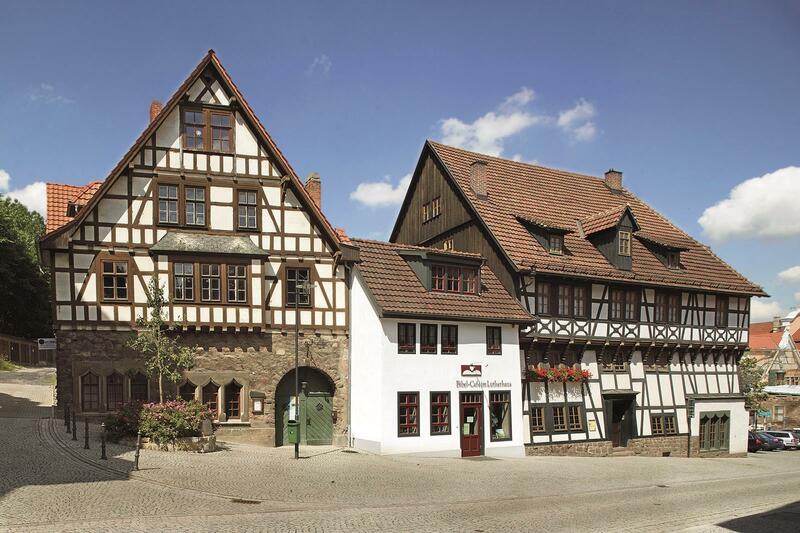 As one of Thuringia’s first important cities, Eisenach still boasts traces of the historical greats that once lived here, including Martin Luther and Johann Sebastian Bach. 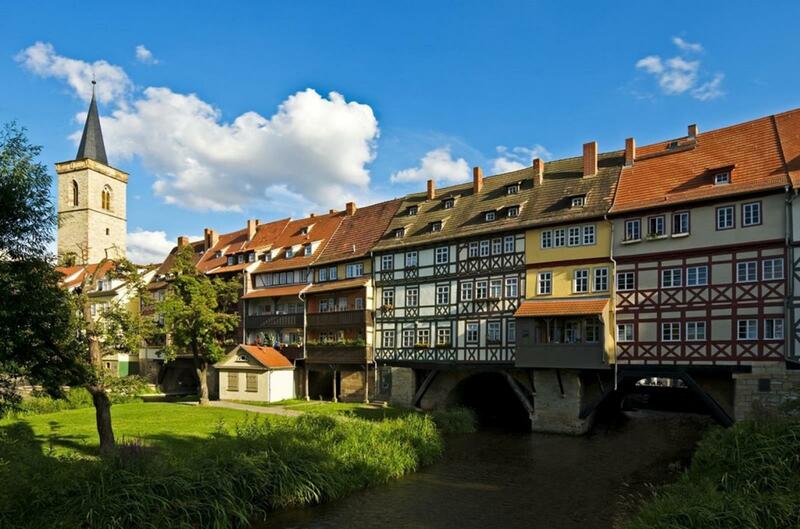 The city invites you to journey back in time while strolling down scenic lanes lined with half-timbered houses that wind through its charming Old Town. 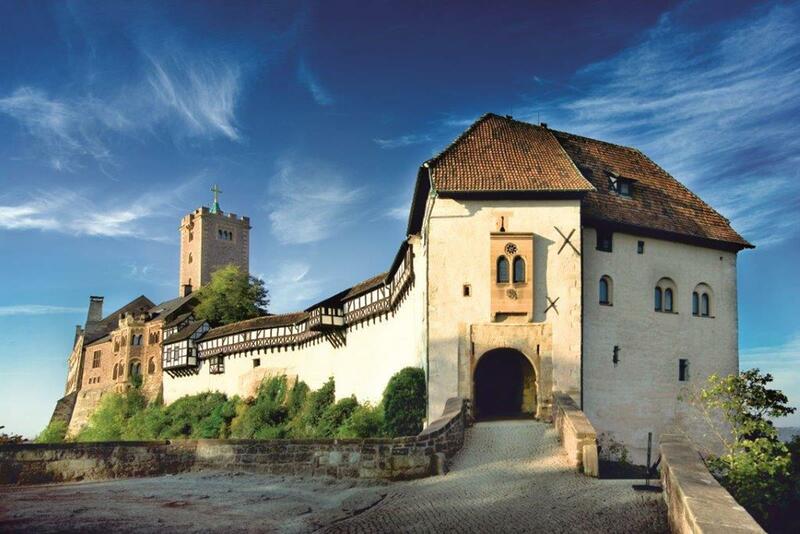 Wartburg Castle: Perched high above the town and flanked on all sides by the enchanting Thuringian Forest lies the city’s most famous landmark: Wartburg Castle. Here, the Great Reformer Martin Luther completed his famous translation of the New Testament from ancient Greek into German in only ten weeks. Setting foot inside the Lutherstube – the actual room where Luther wrote and lived – is considered by many visitors to be one of the most special moments of their trip to LutherCountry. St. George’s Church: Eisenach was also the birthplace of the inimitable Baroque composer Johann Sebastian Bach. He was baptized inside St. George’s Church, the very same church where Martin Luther served as a choirboy from 1498 to 1501. In the months from July to September, music enthusiasts are welcome to attend one of the free organ concerts that take place every day at 11 a.m.
Bach House: Come and visit the world’s first Bach Museum, now one of the largest musician’s museums in Germany whose sole purpose is to “collect and preserve everything relating to Johann Sebastian Bach and his life’s work”. Every hour, guests can enjoy a short concert played on five different Baroque keyboard instruments. Luther House: In Fall 2015, the Luther House will re-open the doors to its museum and permanent exhibition “Luther and the Bible”. A particular highlight is the two rooms where Martin Luther once lived as a child with the Cotta family. This lovely city is known as Luther’s spiritual home. After all, it was here that his journey to becoming the Great Reformer began. Not only did he study theology at the University of Erfurt, but he also became a monk and was ordained right here in Erfurt. Augustinian Monastery: This rare monument to mediaeval religious architecture is also well known for having served as an important stop in Martin Luther’s life. From 1505 to 1511, Luther lived here as an Augustinian monk. Today, guests can dive headlong into Reformation history by visiting the monastery’s unique library of historical books and the permanent exhibition entitled “Bible – Monastery – Luther”. St. Mary’s Cathedral & St. Severi Church: Martin Luther was ordained in St. Mary’s Cathedral, which is famous for its medieval, free-swinging “Gloriosa” bell. St. Mary’s Cathedral is located right next to St. Severi Church and separated only by a grand set of stairs, which also serve as an impressive open air stage for the annual Cathedral Steps Festival. For further information, sample itineraries, and much more, please visit: www.visit-luther.com. For news and regular updates, please check out our Facebook page at www.facebook.com/LutherCountry.